The English Inn can handle wedding parties of up to 200 guests, indoors or out. One of our most popular outdoor wedding ceremony locations is at the pergola on the wooded banks of the Grand River. The setting is surrounded by a garden with a fountain, whose soothing sounds merge with those of the nearby Grand River. A truly memorable outdoor ceremony location. Our English Gardens can also accommodate large weddings and are the crowning glory of the grounds. In season, you could hardly ask for a more lush and beautiful outdoor location. Prefer to have your ceremony and reception indoors? Medovue Hall can accommodate wedding parties of up to 200 or as few as 50. The facility’s elegant marble foyer and romantic, old-world detailing will charm and take you back in time. We have a variety of options for wedding parties of 50 or less, too. Best of all, the English Inn isn’t just a wedding venue, it’s also an 18-room bed and breakfast AND a DiRonA Awarded Restaurant! This means sleeping accommodations for the bridal party, families, and out-of-town guests are on-site. It also means we can cater your event as well as offer rehearsal dinners, morning-after brunches, and more. You don’t have to use our kitchen for your event but it’s there if you need it. Like the rest of your wedding at the English Inn, there are many options. Further, The English Inn is located in the peaceful countryside of Eaton Rapids. This idyllic and seemingly storybook location is really just 20 minutes outside of Lansing and easy for your friends and loved ones to get to. As you can see, when it comes to Lansing MI wedding venues, The English Inn really does have it all. Room and options for a large or small wedding ceremony, reception, lodging, and meals all in one magical place. 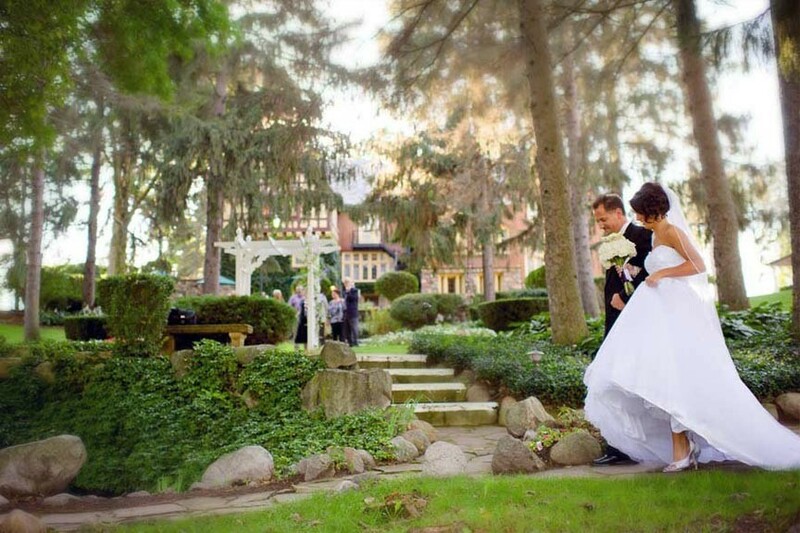 Learn more about our wedding venue near Lansing by visiting our wedding pages.